Marcello Vincenzo Domenico Mastroianni (Italian pronunciation: [marˈtʃɛllo mastroˈjanni]; 28 September 1924 – 19 December 1996) was an Italian film actor. His prominent films include: La Dolce Vita; 8½; La Notte; Divorce Italian Style; Yesterday, Today and Tomorrow; Marriage Italian Style; The 10th Victim; A Special Day; City of Women; Henry IV; Dark Eyes; and Everybody's Fine. His honours included British Film Academy Awards, Best Actor awards at the Cannes Film Festival and two Golden Globe Awards. Mastroianni was born in Fontana Liri, a small village in the Apennines in the province of Frosinone, Lazio, and grew up in Turin and Rome. He was the son of Ida (née Irolle) and Ottone Mastroianni, who ran a carpentry shop, and the nephew of sculptor Umberto Mastroianni. During World War II, after the division into Axis and Allied Italy, he was interned in a loosely guarded German prison camp, from which he escaped to hide in Venice. His brother Ruggero Mastroianni was a film editor who edited a number of his brother's films, and appeared alongside Marcello in Scipione detto anche l'Africano, a spoof of the once popular sword and sandal (peplum) film genre released in 1971. Mastroianni made his screen debut as an uncredited extra in Marionette (1939) when he was fourteen, and made intermittent minor film appearances until landing his first big role in Atto d'accusa (1951). Within a decade he became a major international celebrity, starring in Big Deal on Madonna Street (1958); and in Federico Fellini's La Dolce Vita opposite Anita Ekberg in 1960, where he played a disillusioned and self-loathing tabloid columnist who spends his days and nights exploring Rome's high society. Mastroianni followed La Dolce Vita with another signature role, that of a film director who, amidst self-doubt and troubled love affairs, finds himself in a creative block while making a movie in Fellini's 8½ (1963). His other prominent films include Days of Love (1954) with Marina Vlady; La Notte (1961) with Jeanne Moreau; Too Bad She's Bad (1954), Lucky to Be a Woman (1956), Yesterday, Today and Tomorrow (1963), Marriage Italian-Style (1964), Sunflower (1970), The Priest's Wife (1971), A Special Day (1977) and Robert Altman's Ready to Wear (1994) – all co-starring Sophia Loren; Luchino Visconti's White Nights (1957); Pietro Germi's Divorce, Italian Style (1961); Family Diary (1962) with Jacques Perrin; A Very Private Affair (1962) with Brigitte Bardot; Mario Monicelli's Casanova 70 (1965); Diamonds for Breakfast (1968) with Rita Tushingham; The Pizza Triangle (1970) with Monica Vitti; Massacre in Rome (1973) with Richard Burton; The Sunday Woman (1975) with Jacqueline Bisset; Stay As You Are (1978) with Nastassja Kinski; Fellini's City of Women (1980) and Ginger and Fred (1986); Marco Bellocchio's Henry IV (1984); Macaroni (1985) with Jack Lemmon; Nikita Mikhalkov's Dark Eyes (1987) with Marthe Keller; Giuseppe Tornatore's Everybody's Fine (1990); Used People (1992) with Shirley MacLaine; and Agnès Varda's One Hundred and One Nights (1995). He was nominated for the Academy Award for Best Actor three times: for Divorce Italian Style, A Special Day and Dark Eyes. Mastroianni, Dean Stockwell and Jack Lemmon are the only actors to have been twice awarded the Best Actor at the Cannes Film Festival. Mastroianni won it in 1970 for The Pizza Triangle and in 1987 for Dark Eyes. Mastroianni starred alongside his daughter, Chiara Mastroianni, in Raúl Ruiz's Three Lives and Only One Death in 1996. For this performance he won the Silver Wave Award at the Ft. Lauderdale International Film Festival. His final film, Voyage to the Beginning of the World (1997), was released posthumously. Mastroianni married Flora Carabella (1926–1999) on 12 August 1950. They had one daughter together, Barbara (1951–2018), but separated in 1970 because of his affairs with younger women. Mastroianni's first serious relationship after the separation was with Faye Dunaway, his co-star in A Place for Lovers (1968). Dunaway wanted to marry and have children, but Mastroianni, a Catholic, refused to divorce Carabella. In 1971, after three years of waiting for Mastroianni to change his mind, Dunaway left him. Decades later, Dunaway said: "I wish to this day it had worked out." Mastroianni had a daughter, Chiara Mastroianni (born 28 May 1972), with French actress Catherine Deneuve, who was nearly 20 years his junior and lived with him for four years in the 1970s. During that time, the couple made four movies together: It Only Happens to Others (1971), La cagna (1972), A Slightly Pregnant Man (1973) and Don't Touch the White Woman! (1974). After Mastroianni and Deneuve broke up, Carabella reportedly offered to adopt Chiara because her parents' work kept them away so often. Deneuve would have none of it. According to People magazine, Mastroianni's other lovers included actresses Anouk Aimee, Ursula Andress, Claudia Cardinale and Lauren Hutton. Around 1976, he became involved with Anna Maria Tatò, an author and filmmaker. They remained together until his death. He was made a Knight Grand Cross of the Order of Merit of the Italian Republic in 1994. 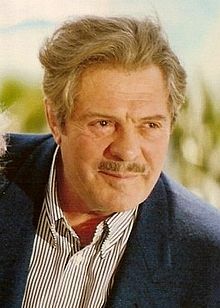 Mastroianni died of pancreatic cancer on 19 December 1996 at the age of 72. Both of his daughters, as well as Deneuve and Tatò, were at his bedside. The Trevi Fountain in Rome, associated with his role in Fellini's La Dolce Vita, was symbolically turned off and draped in black as a tribute. At the 1997 Venice Film Festival, Chiara, Carabella and Deneuve tried to block the screening of Tatò's four-hour documentary, Marcello Mastroianni: I Remember. The festival refused and the movie was shown. The three women reportedly tried to do the same thing at Cannes. Tatò said Mastroianni had willed her all rights to his image. 1989 What Time Is It? ^ Rothe, Anne; Maxine Block; Charles Moritz; Marjorie Dent Candee (1958). Current Biography Yearbook. Hw Wilson Co. p. 261. ^ a b c d e f g Castro, Peter (13 January 1997). "Lover and Legend". People magazine. Retrieved 1 January 2010. ^ Anderson, Ariston (14 October 2018). "Costume Designer Barbara Mastroianni, Daughter of Marcello Mastroianni, Dies at 66". The Hollywood Reporter. Retrieved 30 January 2019. ^ Fusco, Maria Pia (21 April 1999). "E' morta Flora Mastroianni". La Repubblica. p. 45. Retrieved 30 January 2019. ^ Robin Adams Sloan (25 September 1976). Mary Hemingway Keeps In Touch. St. Petersburg Independent. ^ "Marcello Mastroianni, known as 'Latin Lover,' dies". CNN. 19 December 1996. Retrieved 1 January 2010. ^ Wiegand, Christopher. Federico Fellini: ringmaster of dreams, 1920–1993. p. 83. ISBN 978-3-8228-1590-8. ^ a b c d "Family Feud". The Southeast Missourian. 30 August 1997. Retrieved 1 January 2010. Wikimedia Commons has media related to Marcello Mastroianni. Chris Fujiwara, "Dream lover: Marcello Mastroianni at the MFA"